Ambur Biryani is one of a popular Spicy Biryani of Tamil Nadu. Ambur is a place located in Vellore District of Tamil Nadu. This biryani is generally prepared with a small variety rice called Jeeraga Samba. 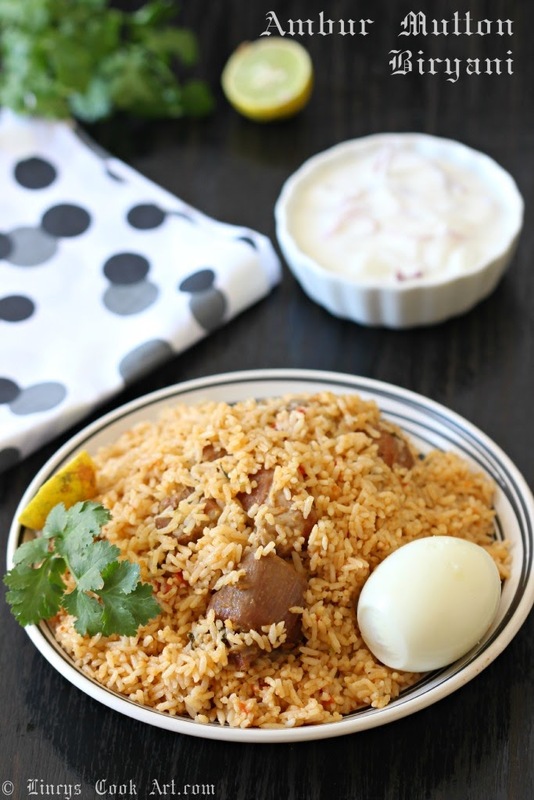 This rice gives different dimension to this biryani regarding taste and also in texture. It is light as there is no ghee used in this biryani and the taste of meat and the rice dominates with the mild flavour come from the garam masala spices. We thoroughly enjoyed this biryani because i did not expect this much taste from a simple to prepare biryani with limited ingredients. You too prepare at your home and satisfy your taste buds. I got this same recipe from the same shop called 'Star Biryani' shop which is so famous for its Ambur biryani. They serve this authentic biryani from 80's. Kirali Tv and Biryani varieties published on aval vikadan booklet the same person shared the same recipe they follow for decades. So i got super excited when try this recipe and so satisfied with the outcome and realised why this biryanis is popular over decades. Wash the jeeraga samba rice and soak for 30 minutes that is just before you start preparing the biryani. Soak dry red chillies in water for 10 minutes and grind as a fine paste. Make the ginger garlic paste. Cut the onion, tomato, coriander and mint leaves; set aside. Heat the pressure cooker and add the oil. Once it becomes hot add cinnamon, clove and cardamom. fry in oil till nice aroma arises. Add one chopped onion and fry in that oil till slight golden colour appear on the edges. Now add the ginger garlic paste and roast till the raw smell leaves. Add the coriander and mint leaves and cook in that oil for a minute. Add the mutton/chicken with some salt and roast well in that oil till the mutton/chicken's outside colour turns from pink to white. Now add the remaining one onion and tomatoes and mix well with the mutton and allow to cook for a minute. Add the ground chilli paste or powder according to your spice level and mix well. Once the raw flavour of chillli leaves add the yogurt and mix well and cook for a minute. Add a cup of water; mix well and close with a lid and pressure cook for about 4 whistles for mutton (or) one whistle for chicken till the meat is soft. Mix twice with a ladle and check for salt and close with a lid and pressure cook for 2 whistles on medium flame and then transfer the cooker to very low flame and keep in sim for 2 minutes for dum to evaporate any extra water. Switch off the gas and allow the steam to go off by itself and open the pressure cooker lid immediately and transfer the biryani on to a broad vessel to stop the cooking process.